In addition to their free stock screener, Morningstar offers a more robust screener as part of their Premium membership package. If, like many investors, you screen for mutual funds as well as stocks, the premium package may be the best overall value for you. And if you rely on their full set of proprietary Morningstar ratings, there is no other game in town. You can use their 14 day trial to evaluate this screener if it appears to meet your needs. Before starting the trial, check out the proprietary items (Style Box, Stock Grades and Stock Ratings) if you are not familiar with them. Notice that there are pre-built screens - a great way to begin and get a feel for product navigation and operation. And maybe a starting point for a useful personal screen. 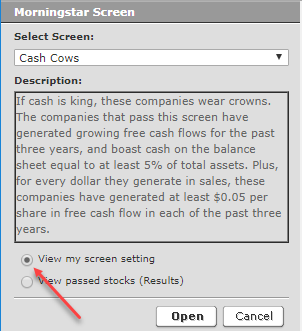 To examine criteria selection and creation, select "View my screen setting". This populates the screen builder shown above with the criteria associated with the pre-built screen. From there you can examine the criteria and change as desired. From the screener you can examine the passing stocks any time you choose. A brief explanation of the screen rationale is available for each pre-defined stock screen. If you do alter the pre-built screen, save your version by name for future reference. Clicking the button on the lower right of the screen displays a list of the passing companies. The results of the Cash Cows screen were sorted by market cap. If your investing strategies call for technical analysis, you will need to make that analysis elsewhere – stock technical analysis is not available. As noted above, custom screens can be saved by name for later recall / use and can be created by modifying the Morningstar pre-defined screens. The date of the fundamental data is not available directly as a screening criteria, but the MorningStar analysis date is available with the results of the screen. It is possible to compare valuation and growth data to sector and benchmark values or absolute values. The year over year historical data is extensive (5 years of financial statement data) and trailing twelve month data is available. Quarter over quarter is not available. Running the screen creates a list of companies passing the screen. Company data points listed in the results can be selected independent of the screening criteria. 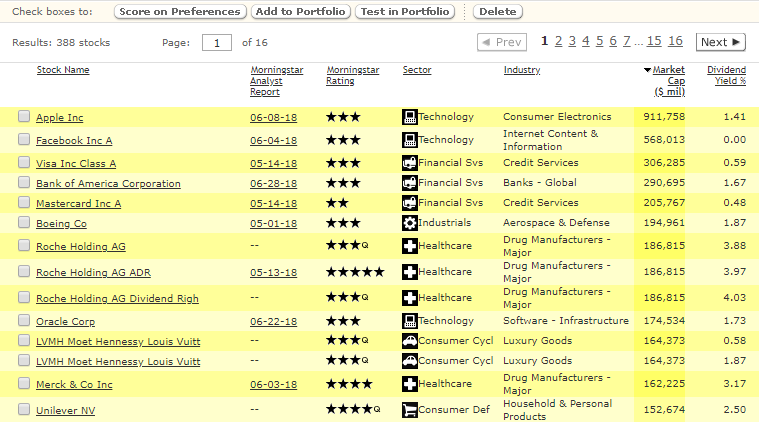 You can also go directly to Morningstar’s financial data for any of the companies. Multiple reports can be created and saved if more than one data view is desired. Passing companies can be saved in the portfolio manager where they can be tracked or downloaded for offline analysis. It is possible to de-select a company if you do not wish to move it to the portfolio manager. Neither the criteria operators nor the data points allow for limiting the number of results by percentile or ranking. If ranking or limiting results is important to you, the workaround is to sort the list by one or more of the fields in the resulting report and de-select the unwanted companies. Morningstar is best known for their fund style boxes, fund research, the 5 star mutual fund ratings. Now they offer proprietary stock ratings and an economic moat measure as screening criteria. This sets their stock screener apart from most other screeners. Both “OR” logic and “AND” logic are provided. Unfortunately, neither custom formulas nor backtesting are available. A “test” of your screen results is offered as a function of the portfolio manager. While better than nothing, it is not backtesting. It is not possible to screen against a custom basket of stocks created externally or residing in a portfolio. If you need a custom list, you need to create it within the screen. Your personal investing strategies identify the data and logic needs of the best screener for you. Both strategies are discussed in detail in the strategies section. This is a quality product focused on the Morningstar stock ratings and stock screens that look back into the historical performance of a company. For many, the Premium package will be the best stock screener available – particularly if you invest in both stocks and mutual funds. You can access the 14 day trial here or simply register for access to free features.